Are you curious if Halloween candy does really have an effects on your kids? Watch the video to see it yourself. As I see it… it definitely has. The kids go crazy and gets extra hyper active when they are around candies. They can’t stop eating and gets a little angry when they were not able to get one. Kids and candies always go together for kids just love it from the bottom of their sweet tooth. COMMENT if your kids also loves candies. 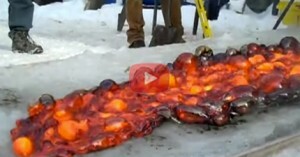 What Happens When Lava Meets Ice? Not What You’d Expect!